In stock -This product will ship today if ordered within the next 8 hours and 22 minutes. 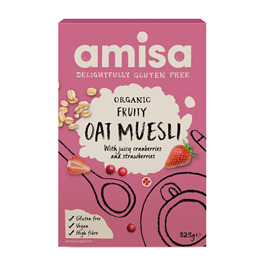 Amisa Organic Fruity Oat Muesli is made with tangy cranberries, fruity strawberries, golden linseed and sunflower seeds. Excellent as a breakfast food or healthy snack. Wholegrain oats* (68%), dried fruit mix* (19%) (sultanas*, cranberries* (3%), apples*, freeze dried strawberries* (0.5%), cane sugar*, sunflower oil*), sunflower seeds* (9%), linseed gold* (4%). 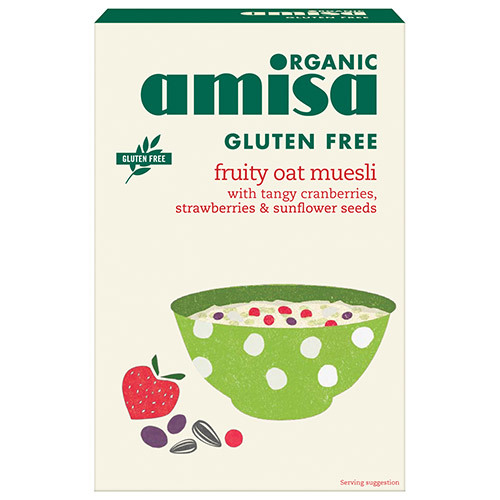 Below are reviews of Amisa Organic Fruity Oat Muesli - 325g by bodykind customers. If you have tried this product we'd love to hear what you think so please leave a review.